Broncos and Seahawks, you have joined that most prestigious company of champions who’ve contended for greatness: the college quad, s’mores and sing-alongs, American flag lapel pins, bubbly, highway robbers, frolicking, shrimp scampi, and bran. Contend with that, you gridiron gladiators. Contend with etymology, the great emasculator. At the root of champion is a word and a metonym–Latin’s campus, “field.” Perhaps the most famous field in ancient Rome was the Campus Martius, or Field of Mars. On this Tiber flood-plain Roman armies would muster, conduct exercises, and proceed in military triumph. Later, temples, theaters, and other imperial edifices populated the field, home to electoral events and athletic entertainment. The Late Latin campio (declined along campion-) named a “warrior” or “fighter,” giving French champion. Perhaps the word comes straight from the Latin campus, but, as Partridge’s research shows, German mercenaries adopted campus and adapted it to *kamp. Indeed, German has Kampf, “fight,” “battle,” and “struggle,” as in Mein Kampf and Kulturkampf. Champion moved into the athletic field, apparently, in the 1730s, with its sense of “first-place performer,” (Online Etymology Dictionary) probably with respect to boxing, horse-racing, golf, cricket, chess, or the Welsh, field and ice hockey-like game, bando. Don’t mess with the bando stick. Courtesy of the National Museum of Wales. Old French has champagne, “open country,” from an adjectival form of campus. The sense of military campaigns, or an “army’s operations in the field,” “arose in those conditions of warfare according to which an army remained in quarters during the winter and on the approach of summer went into the country…to conduct operations” (ODEE). Unsurprisingly, politics not only appropriated many military metaphors, but, as continues in large part today, marched in step with military matters. Let’s pop open some Champagne, the province (literally, “open country”) in northeast France, “whence…the scintillant wine made there,” as Partridge glosses it. Don’t get too tipsy if you have an exam on campus, the “college or university grounds,” which ODEE first cites in the 18th century in reference to Princeton in New Jersey. We’ve all done battle with finals, but academics, too, has its share of military metaphors, including class, originally referring to “the people of Rome under arms” (Online Etymology Dictionary). And don’t be a scamp, you mischievous, idling, rascally…highway robber? To scamp indeed meant to commit so in the 18th century, stealing a sense of “slipping away”–or scampering–that probably comes from the Latin excampare, literally, “out of the field,” as in fleeing the battlefield. Scamp may also explain scam. Camping, decamp, encamp, the field mushroom champignon–these are other cognates of campus. But wherefore this campus? 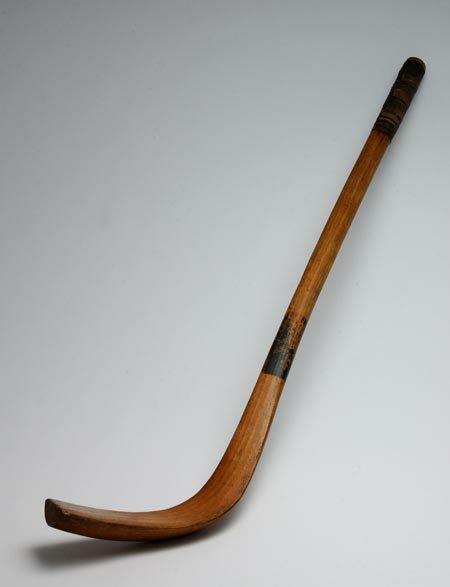 Partridge speculates a relationship with a “remotely possible cognate” in the Hittite kanza, or “grass” or “cereal.” He also cites Bloch and von Wartburg’s hypothesis that it survives from “an ancient Italic language.” Shipley has it from the Proto-Indo-European *kam, meaning “bend,” “curve,” or “vault,” thus linking it to everything from cummerbund, gams (as in “legs,” from gambol), and camera. This same kink likely explains the Italian scampi (scampo is Italian for “prawn”). Camera is dubious. And, as Shipley observes, cummerbund (Hindi: kamarband) is verily from Persian’s kamar, “girdle” or “waist,” along with a form of the root of bind and bend, but I see no compelling evidence to link kamar with campus. 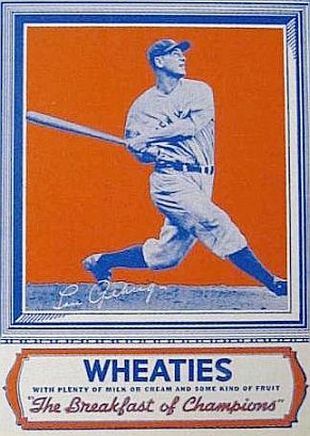 If indeed the Hittite kanza–again, “grass” or “cereal”–gave rise to Latin’s campus, then General Mills’ Wheaties may be “The Breakfast of Champions” in ways more than one. Lou Gehrig, 1934. Courtesy of pophistorydig.com. I’d like to see Lou Gehrig take on a Hittite. There’s an easy “Bazooka Joke” somewhere in there. A good origin story, the “Breakfast of Champions” slogan is, and all-American–it features baseball, radio, and individual genius. Check it out here. But the origin of words, as champion itself can attest, isn’t always so straightforward. They bend, they curve. They are so often quirky, charming, unpredictable, unusual–perhaps more like Kurt Vonnegut’s Breakfast of Champions.